units for you to choose. Each style is a combination of different parts, which brings convenience for maintenance. The thickness of the surface panel is 2mm. Designed in accordance with HTM2022 standard. Each bed head unit has four cavities for different pipelines. 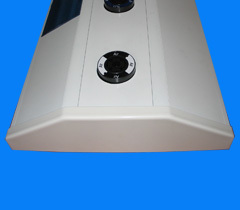 The surface of the bed head unit can be painted into different colors according to your request, using static-electricity-painting technology. Different parts can be painted into different colors. Gas outlets of different standards are available. We can also provide electrical switches and electrical sockets of British standard, French standard, Australian standard, etc.. The length can be customerized. Street Address: The 8th Floor, No.